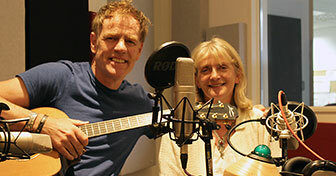 The Welsh singer Martyn Joseph has been performing and recording for over 30 years. Having begun his career with positive songs that affirmed his Christian faith, his music has become more nuanced. The self-proclaimed ‘liberal backslider’ talks to Alison Hilliard about his journey from answers to questions through his favourite Bible readings, read by David Suchet. He explains how a trip to Thailand and some preaching on John the Baptist turned his world ‘from black and white to full colour’, and his feelings about criticism, and even a death threat, from some Christians. Martyn traces his concern for social justice back to Jesus’ sermon on the mount, and relishes the way Jesus deals with a woman accused of adultery. In the story of the prodigal son, Martyn explains that whilst at times he knows he is like the judgemental older brother, at heart he wants to be the younger brother, coming home. Hi Tracy. The full half-hour programme is available above to stream or download. Is it not working for you? I would like to get the full podcast interview with martin Joseph . Could u send me the link or how to get the full interview please. Love Martyn a true inspiration to me and my writing and my peace from listening to his wonderful music.one of the worlds most amazing wordsmiths who gives so much and remains a gentleman to meet .I wish him only love and peace in all his future ventures..